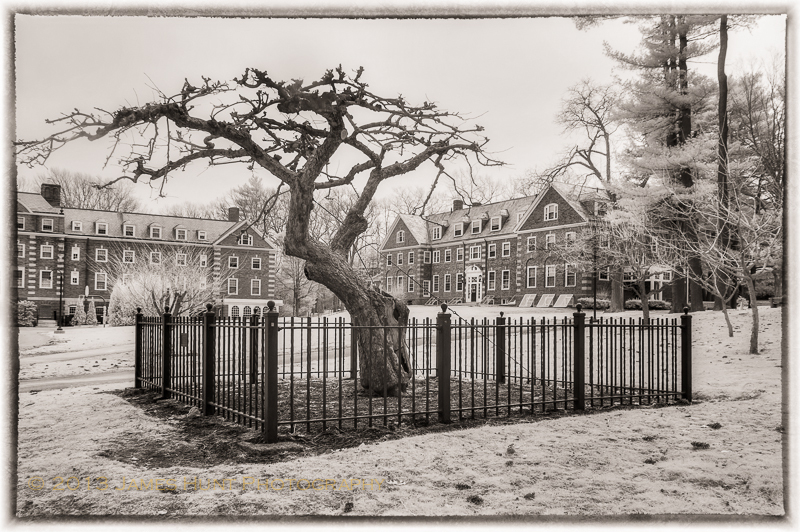 Several years back I wrote a blog post about one of my favorite trees, the Newton Apple Tree on the campus of Babson College. It was a wonderful contemplative tree located right in the middle of the busy campus. In spite of being in the middle of everything it was still a peaceful oasis. The backstory is that it was supposedly a descendent of THE Newton Apple Tree, the one that inspired Sir Isaac to think through gravity. Roger Babson, founder of Babson College, was a Newtonophile big time and had the resources to pull something like that off, so it could be true. But we, many of us who worked there and some students, cherished the tree and would have done so regardless of its lineage. Alas, aging and construction meant the end of the tree a few years back, which I was honored to be able to chronicle while saying goodbye. 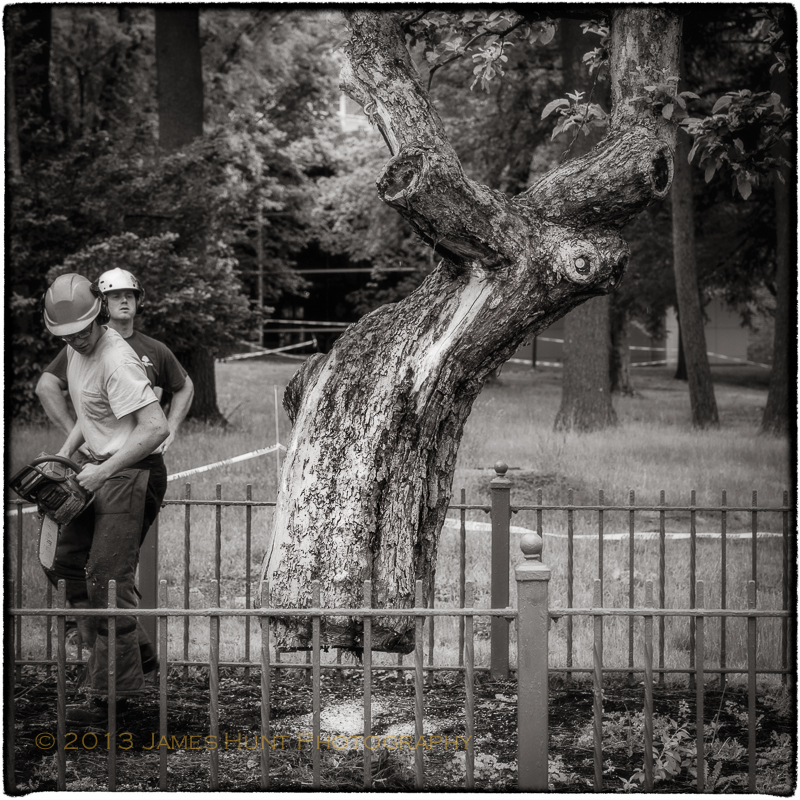 The penultimate image, “Goodbye Isaac” was chosen recently by juror Tom Zetterstrom for inclusion in Photoplace Gallery’s current exhibition, Celebration of Trees. I am honored for Isaac to be included in such an interesting exhibition. You can read about the exhibition and the Gallery here. If you’re interested, at that link you can order a copy of the exhibition catalogue. The Photoplace Gallery is a wonderful exhibition opportunity created for emerging fine art photographers. They are located in Middlebury, Vermont and definitely worth the trip. I couldn’t leave off though without a picture of Isaac in more pleasant times. 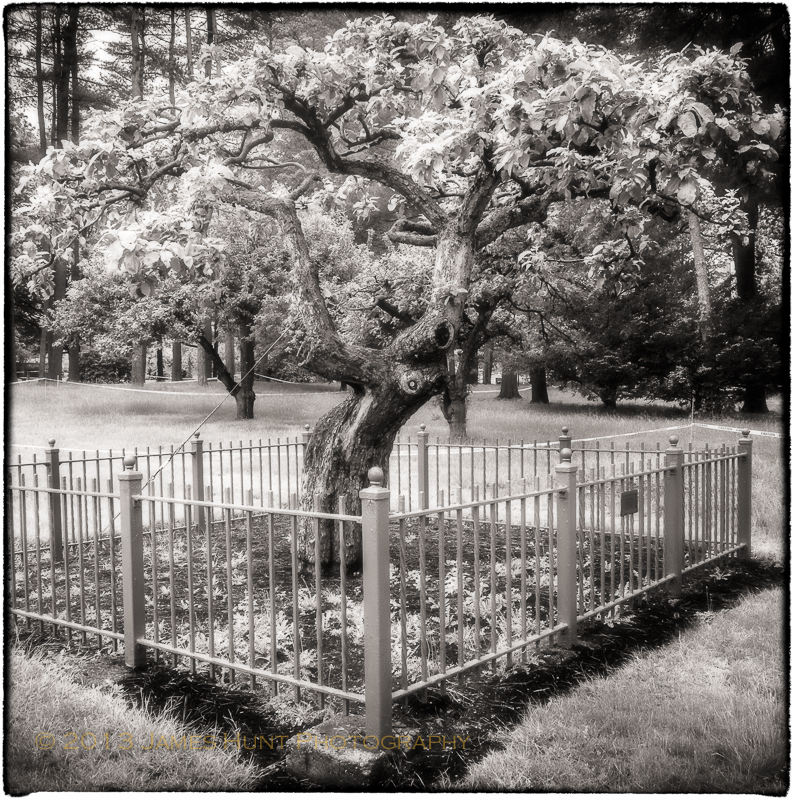 I’ve written previously about the Isaac Newton apple trees on the campus of Babson College, where I work. They are a wonderful symbol of the intellectual curiosity and excitement of the founder, Roger Babson as well as his appreciation of the natural world. They were grown from cuttings from the original tree that helped Newton deduce the laws of gravity. Many trees have come from that line but my favorite, and the favorite of many on campus is this particular tree, which was planted in 1954. It is old as fruit trees go, quite old. It’s longevity is really the product of the hard work of the Facilities staff of the College. But caring ultimately can’t conquer time. Last Wednesday, was the time chosen for Sir Isaac’s and Roger’s tree to be taken down. The tree is still producing leaves, as you can see here. Examination by experts though over several years, made it clear that it was extraordinarily fragile. Building will be taking place nearby. It could not survive a move. So with reluctance, the decision was made that this was the time. The College did a very good job of communicating the issues to the community, thankfully. Ever since I came to Babson I have found the tree to be a place of contemplation, a place that was very helpful, even necessary at times. It turns out, I was not alone. Other came to say goodbye last Wednesday morning. It was difficult to watch, to experience, but I’m glad I was there. The day began like a bad trip to the doctor. Waiting. 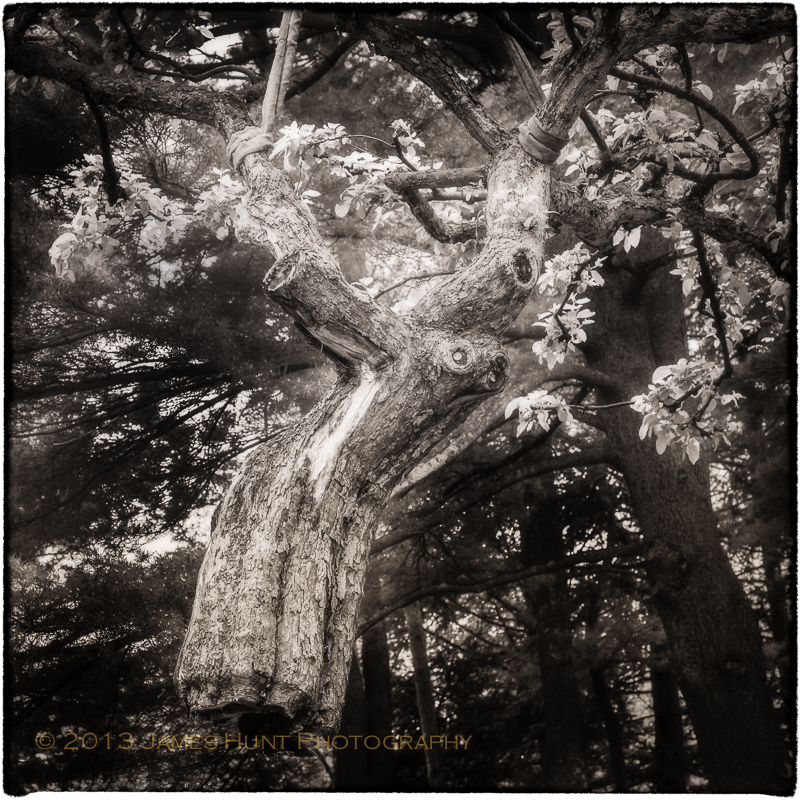 Clearly I have a deep affection for nature and at times, anthropomorphize trees. Relationships are what we put into them. 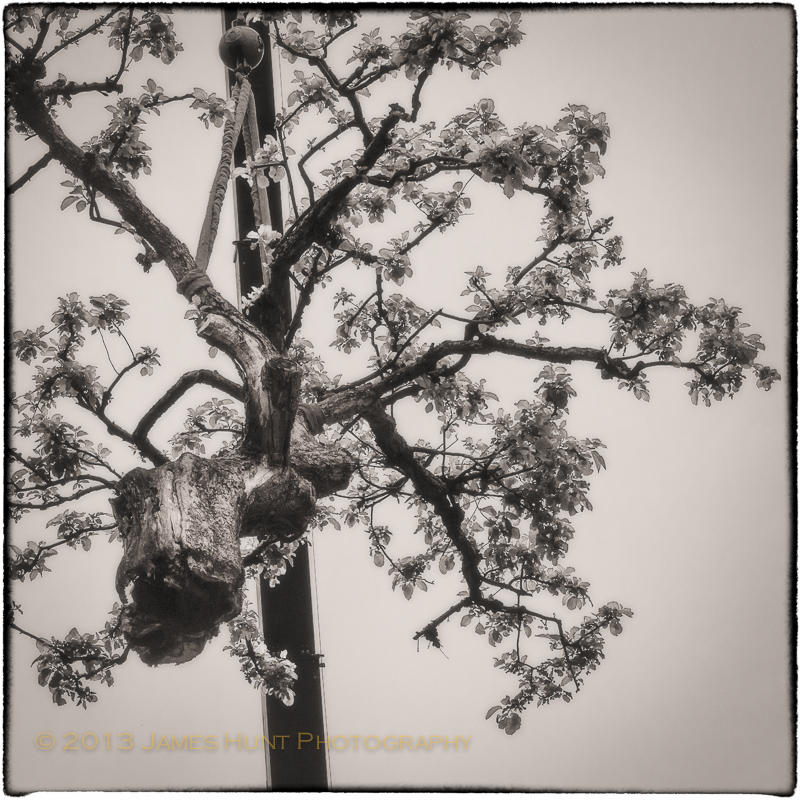 Watching arborists at work has always fascinated me. Like many professions whose work doesn’t make it to the TV or computer screen, we don’t realize just how complicated the job is. 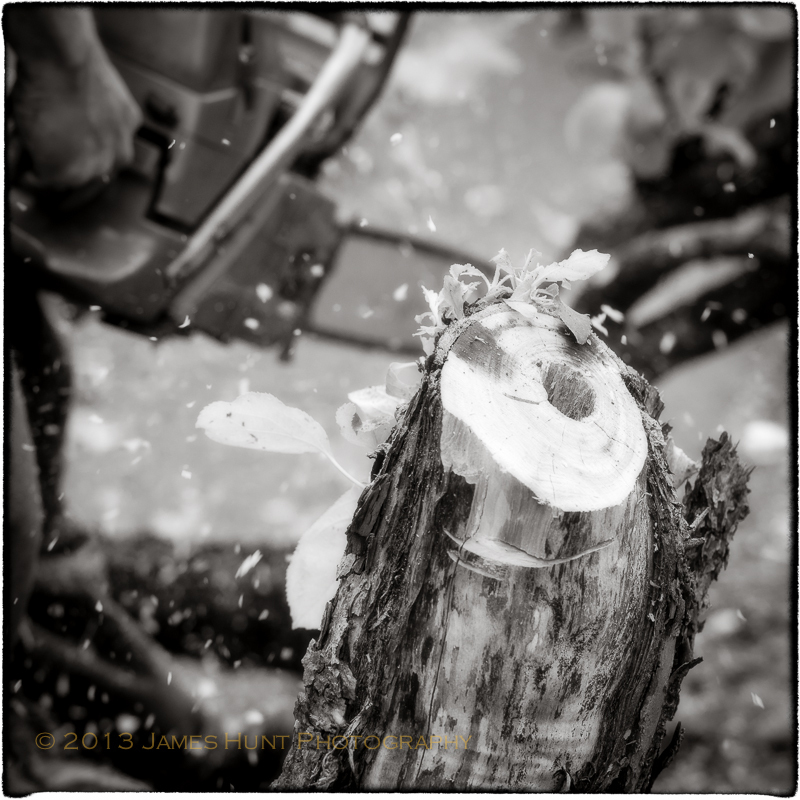 I’ve had the good fortune to photograph a number of arborists over the years, and have come to view them as part craftsman/woman, part scientist/engineer, part naturalist, part business person, etc. They have a lot going on. I was struck here by their exercise of craft. 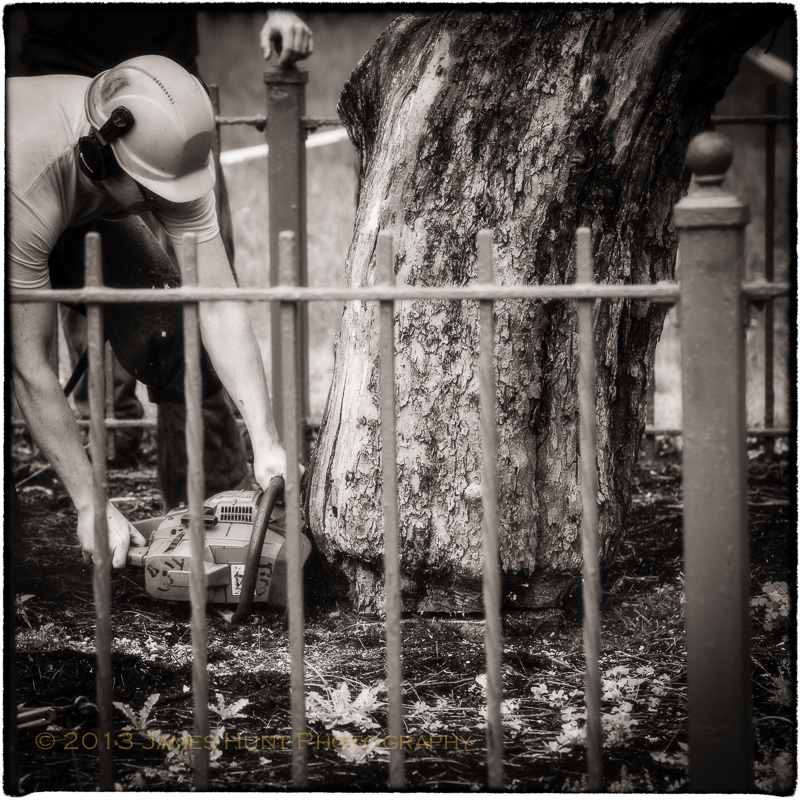 The removal of a tree in close quarters is difficult and can be dangerous. In addition, they were quite aware that this tree was special. I appreciated that. Preparation took the better part of half an hour. I was reminded then of the carpenters’ oath: measure twice, cut once. 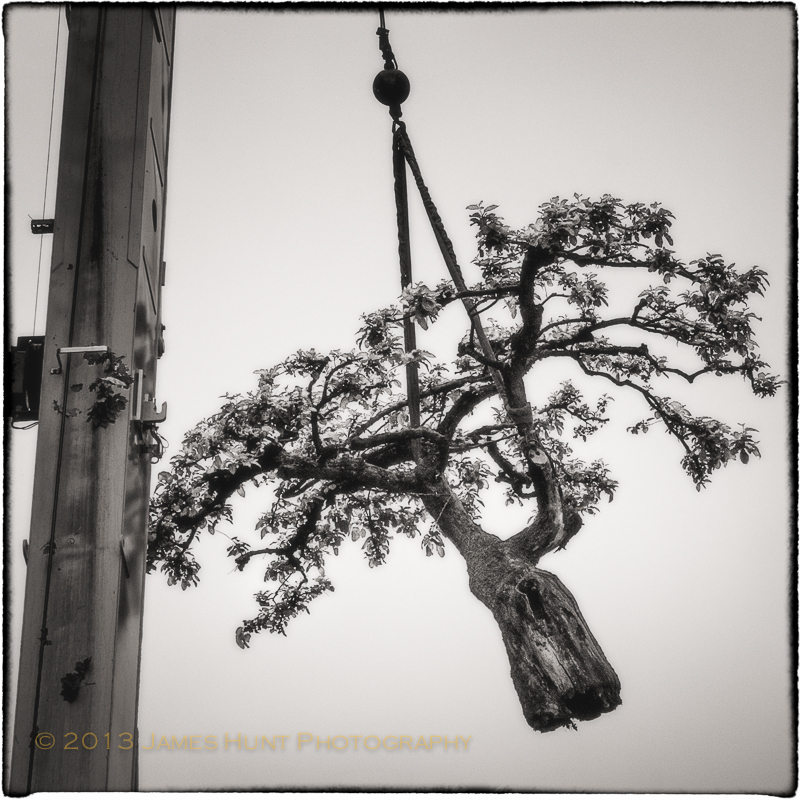 The tree was being held up at this point by a cable from a crane, tied carefully to the trunk and upper branches. The cut took just a minute or two, after which Sir Isaac’s tree was released from the bonds of gravity. And moved toward the heavens. The ascent also lasted only a few minutes. 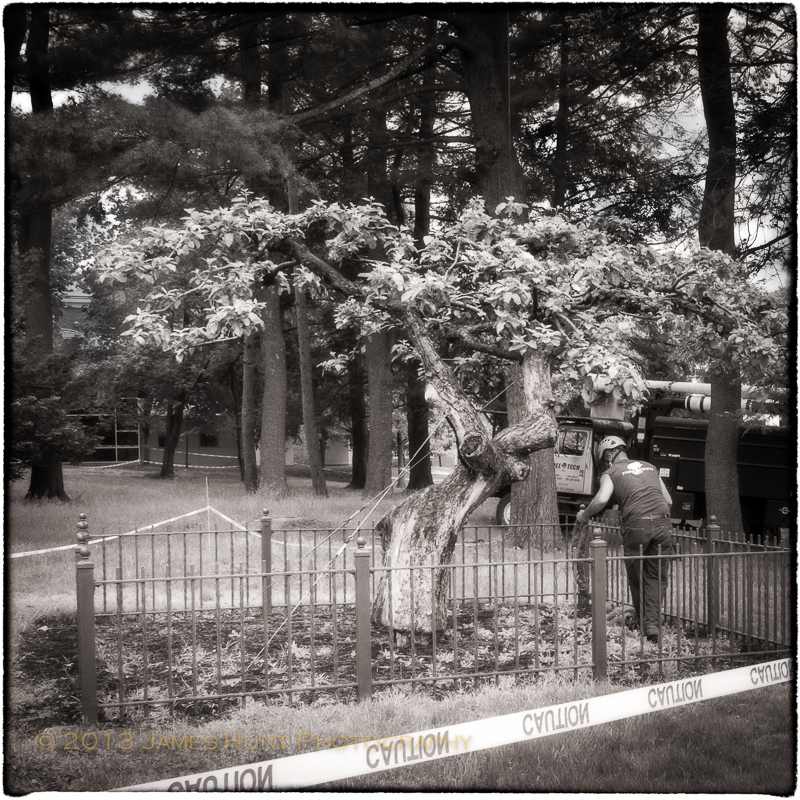 The tree was then laid on the ground and the arborists and staff from the College examined it, and could clearly see that indeed, it was literally a shell of its former self. Much of the wood, however, as well as the remaining cuttings will be saved for gifts and other symbols. 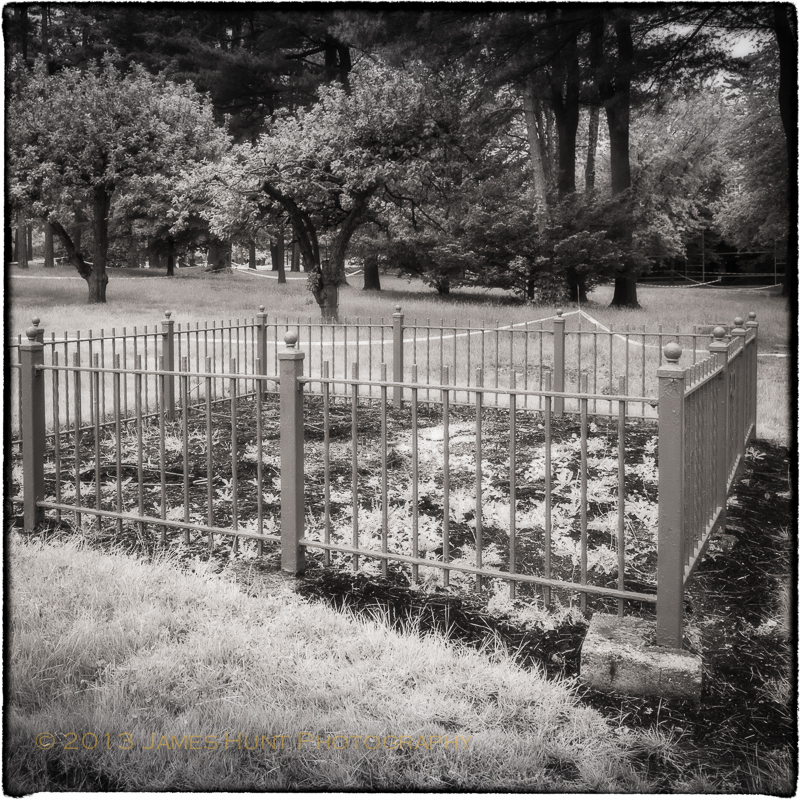 It is difficult to come to grips with just how powerless we are in the face of our mortality. We try not to think about it, but there are reminders. I’m glad that I had a chance to get to know Sir Isaac’s tree, and to share it’s life with quite a few other admirers on the campus. It occurred to me that, hey, this is a college campus and I’ve been here quite a while. I’ve never seen any form of disrespect paid to the tree. Not so much as a piece of liter or toilet paper. From what I’m told, my perception is accurate. So now, we move ahead. 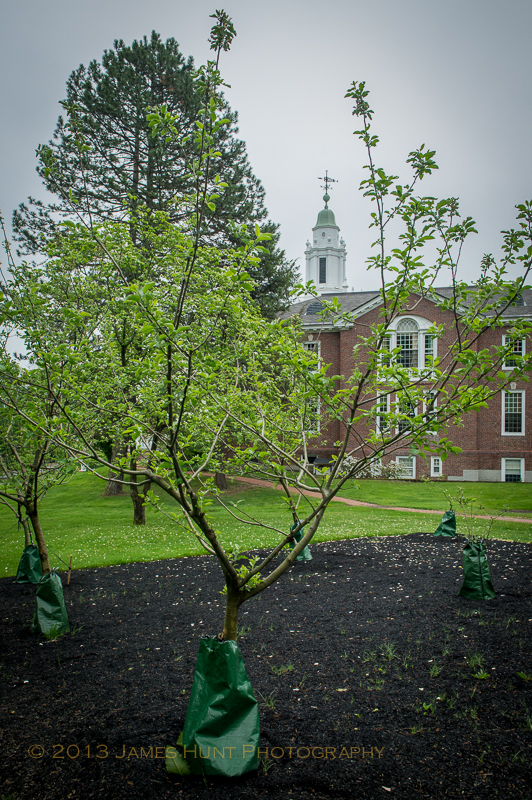 Here is Babson’s new apple tree grove, and you can guess where the seedlings came from. I want to thank Stephen Tolley who was in charge of the project for giving me access and background. I also want to thank Stephen and colleagues for the care they demonstrated. Best wishes to those in the USA and elsewhere who observe Memorial Day and pay their respects this weekend. I’m happy to announce a new one artist exhibition of my work scheduled for the Richard W. Sorenson Center for the Arts at Babson College. 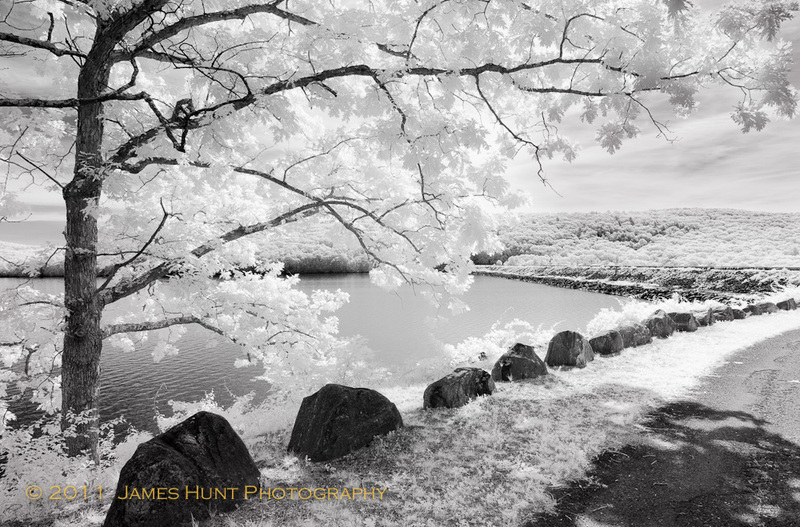 The exhibition is titled “Boston’s Water” and presents 13 black and white prints from the Quabbin Reservoir, taken over the last three years. I have to say, staging an exhibition is far more work that I had realized. Getting the right print of each image is only the beginning. Framing is tough, but hanging the images has to be the worst. Luckily, I had the invaluable assistance (actually he did it, I assisted him) of Mark Lorenzo from the Sorenson Center and his colleagues. The exhibition itself is kicking off a celebration at Babson of the Principles of Responsible Management Education developed under the leadership of the United Nations and to which Babson is a signatory. It is indeed the case that many of us involved in business education care deeply about the profound failures of ethical fiber and will we have all encountered over more than a decade. Honestly though, it is an uphill battle. Students, even those interested in business, are very discouraged about our ability to right the ship and engage in commerce in a sustainable manner. Part of what is needed is better government regulation of commerce, but that’s not enough. As a teacher, I see everyday the intense interest that students hold in making the world a better place (yes, believe it or not, business students as well). We have to help them realize their dreams. I want to thank Elizabeth Goldberg, Associate Professor of English at Babson and Michelle Oshima, Director of the Sorenson Center for the Arts for signing me up. I also want to thank David Akiba, Photography Instructor at Babson and an enormously talented fine art photographer himself, for his advice in pulling the exhibition together. The exhibition is housed on the second floor of the Sorenson Center at Babson College in Wellesley, Massachusetts, in what is becoming the new photography exhibition space.